I grew up hating Beef Stroganoff with a passion. My mom’s recipe used cream of mushroom soup which I could not stand as a kid. Mind you I was a very picky eater and hard to please. The list of foods I would eat was short. I know I gave my parents a very hard time with eating as a kid. Thankfully I grew out of it and now am willing to try just about anything at least once. A big change from my 8 year old self! 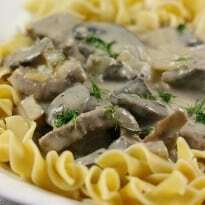 This recipe for Beef Stroganoff does not include cream of mushroom soup and is also made in the slow cooker. It uses fresh mushrooms not canned – which I still don’t like. There’s no pre-cooking anything. Just dump all the ingredients in the slow cooker except the sour cream and set it on low. Simple! My house smells so good while it’s cooking and it’s hard to not want to sneak a quick taste. My niece, Avery, was visiting over the holidays and spent the night at our house. She’s six years old and cute as a button. She’s also very intelligent and told me that she loved the recipe. She cleaned her entire plate! She is not picky like my girls! Bridget would only eat the sauce as long as I didn’t get any mushrooms in it. Olivia ate it and thankfully has outgrown her picky behaviour. I would make this more often if steak wasn’t so darn expensive. It’s funny because steak was cheaper in Nova Scotia, but chicken was pricey. Here in Ontario, it’s the opposite! We eat more chicken, but I do like to mix it up with beef every so often. How do you make your Beef Stroganoff? A classic recipe made with a creamy mushroom sauce, steak and served over a bed of tender egg noodles. A family favorite! Place steak, onions, Dijon mustard, salt, pepper, dill, mushrooms and garlic in a slow cooker and stir together. In a mixing bowl, add the flour and then slowly whisk in the beef broth. Add to slow cooker mixture and stir together. Turn slow cooker off and remove lid and let sit for 10 to 15 minutes. Stir in sour cream. Serve sauce on a bed of egg noodles. Garnish with fresh dill, if desired. 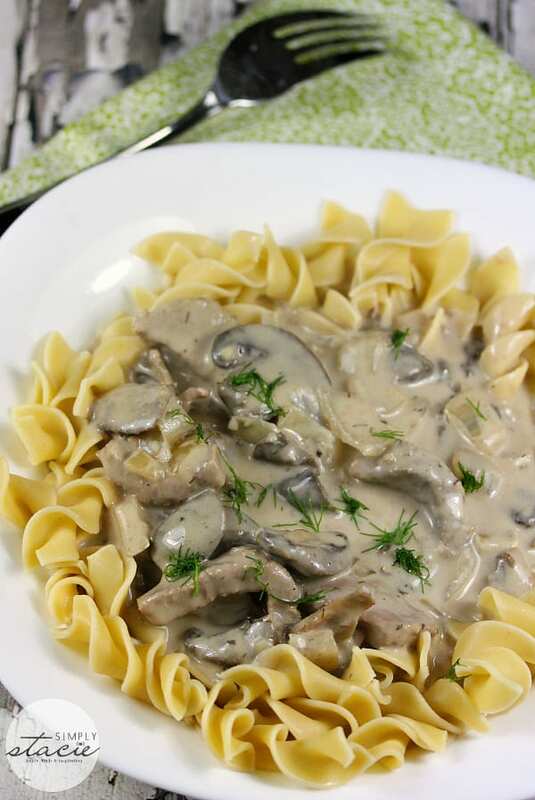 LOVE Beef Stroganoff and love it even more now knowing I can make it in the slow cooker! 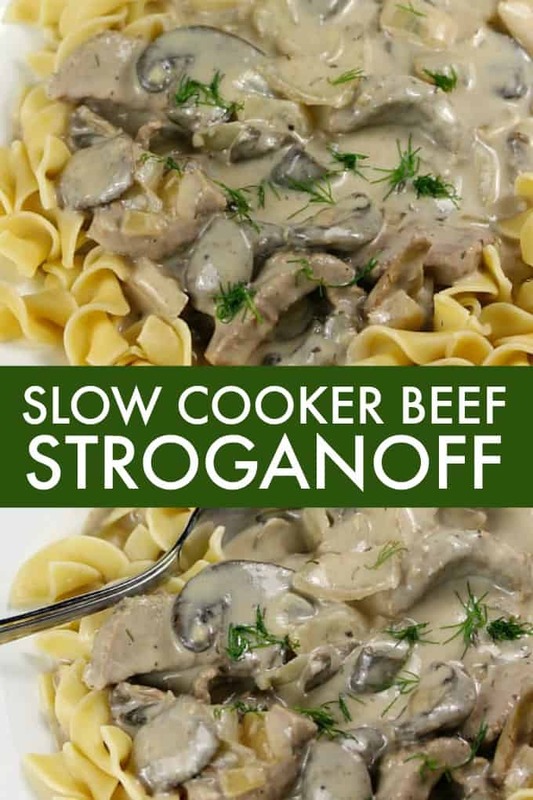 I make my Beef Stroganoff in the Slow Cooker! But this is not the recipe I use. I want to make Beef Stroganoff using your recipe next time. It looks so delicious! Thanks for sharing! 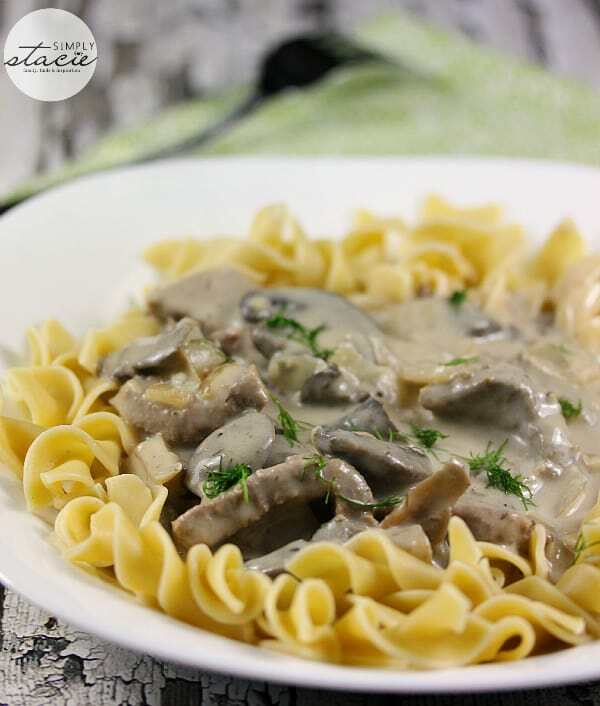 I’ve never done Beef Stroganoff in the slow cooker….something to try over the weekend! My hubby bought me a new slow cooker for Christmas, so I can’t wait to give this recipe a try, thanks for sharing!! My daughter doesn’t like them either. Just leave them out – should be fine! Looks like a yummy recipe. My dad doesn’t like can mushrooms either. My daughter doesn’t like any kind of mushrooms, so when I make beef stroganoff in the crockpot, she just has to pick them out. Happy New Year! Love beef stroganoff, thank you for this recipe! I’ve never done it in a slow cooker. I love beef stroganoff. i don’t eat beef or pork and I have never made beef stroganoff. It would definitely make a nice hearty meal for people who eat beef.Perhaps I can substitute in some chicken or vegetables. It does look delicious even though I can’t eat it. Thank you for sharing this recipe. I recently had “beef” Stroganoff with tuna instead of beef on a canoeing trip. It sounded gross. I was skeptical. But, I tried it and it was delish!! The recipe was taken from the back of a Schilling stroganoff mix. This slow cooker recipe might work as well though I would tend to put the tuna in at the last, like the sour cream. Good luck!! Mushrooms are hearty enough to stand on their own and many vegetarians use them in place of meat. Just try increasing the amount of mushrooms, and maybe add some quality beef stock just for flavor, if that’s not unappealing?? But it should also work well with chicken. Funny, my husband just mentioned today that he would like this on the weekend! Was going to look for a recipe! How handy! Thanks! Beef stroganoff is something the whole family enjoys. Wonderful time of year for slow-cooker recipes and warming, comfort food. Sounds great! I have a microwave recipe which came in a book with my first microwave over 30 years ago. Takes about 20 minutes to cook. uses no spices, just beef broth, salt and pepper. I will still probably cook it that way, but may add the garlic, dill and mustard next time. This seems good. I will add this to my recipes. I love crock pot meals. I work full time and so crock pot meals are a way of life in my house. This sounds absolutely delicious and easy! I hope to try it soon. Thanks! Mmmm I love Beef Stroganoff. Need to dig out the slow cooker! I have never made beef stroganoff but I love it! Thank you for the recipe!! LOVE this! 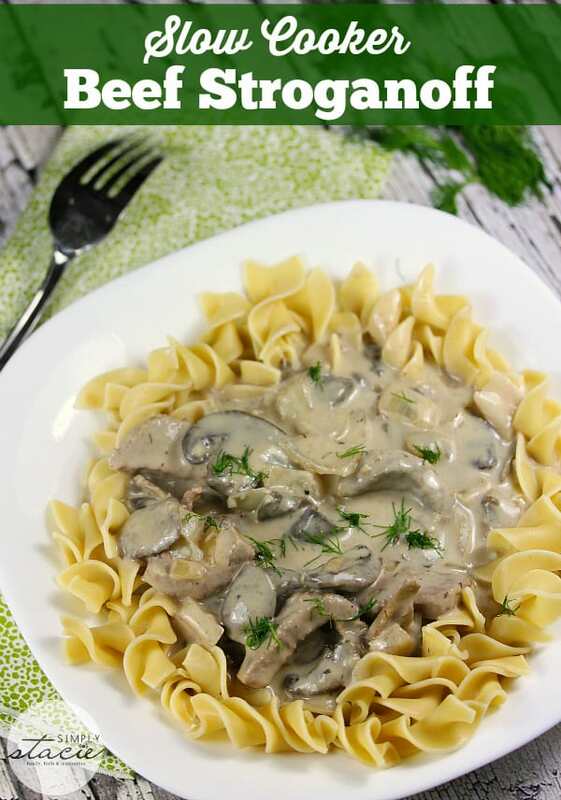 Pinned this recipe because I have been searching for a fresh ingredient beef stroganoff! So glad to have found this over at nifty thrifty Sunday! I *-* love the spices and herbs in this.I have tried beef stoganoff before but will have to try this one.I haven’t had it in a while and this sounds devine.Thank you. Looks so delicious,thanks for sharing! 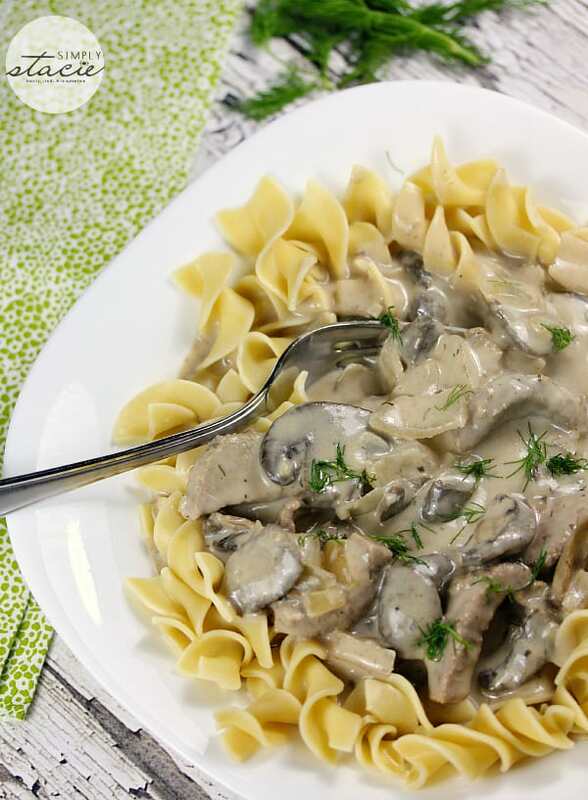 Thank you for sharing your Delicious Beef Stroganoff Slow cooker recipe. It sure does look and sound Yummy! My Husband really loves Beef Stroganoff. So happy I can now make it in the slow cooker. I piinned your recipe for my use! I love beef stroganoff. I add sweet peas for taste and color. I bet you could use chicken or left over Turkey I might try that and add celery. Thanks for the ideal it sounds awesome. I have often made Beef Stroganoff many times but not lately. I really love this dish. Thank you so much for this recipe for the slow cooker., and for sharing it with us.